This color was described in the national magazines as being tinted like some rare orchid petal, a dainty, tantalizing purple. Alexandrite is often confused with Hawthorne, another Heisey color. Alexandrite is lavender, similar to the Alexandrite stone, which has a blue hue under certain light conditions. Under a florescent light, Alexandrite turns blue–Hawthorne does not. Hawthorne is somewhat darker than Alexandrite and can be distinguished either by the black light or by placing the two colors side by side on a white background. Other companies produced colors similar to Alexandrite. For example, Cambridge issued a Heatherbloom and Fostoria made Wisteria. The Heisey Alexandrite, however, contained a bit more pink.Stemware patterns made in beautiful Alexandrite were #3380 Old Dominion, #3381 Creole, and #3390 Carcassonne. Alexandrite pressed-ware pieces were available in #1401 Empress, with a few pieces of #1252 Twist and #1184 Yeoman also being made. 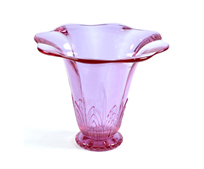 In addition, assorted vases, candlesticks, and the #301 candelabra were manufactured in Alexandrite. A special beauty is the #1000 marmalade jar. Other items were produced in Alexandrite, but the ones mentioned above are the most common in this color. This color was produced periodically during the lifetime of the Heisey company. 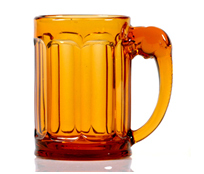 Much Amber was made for Fred Harvey, both for railroad and restaurant use. Amber was not run continually, but was brought back as orders warranted.In later years it was made a production color for a very short time, it was somewhat darker and called “Sultana.” Several of the Heisey animals were made in amber and are very desirable. 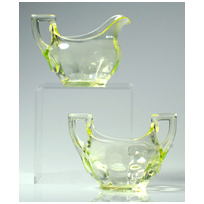 There are also some stemware lines that have amber bowls or stems. Black opaque was an experimental color and was never expanded for consumer use.Only a very few items were ever made in black, and to have one in your collection would be quite a find. They include the #351 Priscilla Oval Mayonnaise Underplate, the #1540 Lariat 8″ salad Plate, and a few pieces of #1637A Town & Country. Pastel blue is thought to be an experimental color made for special orders or testing on the market. This color is similar to some shades of Limelight or Zircon, but it has more of a blue tint. It is in extremely limited supply.Though not as limited as black, any of the following are items in Trial Blue would be a good find: #4085 Kohinoor 9 oz. Low Ftd. Goblet, #1435 Individual Ash Tray, #3368 Albemarle 5 oz. Sherbet. Canary and Vaseline are the same greenish-yellow, referred to as “Canary” by Heisey and as “Vaseline” by collectors. 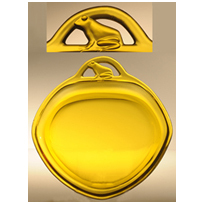 This glass will glow bright yellow under a black light.Because Canary is an early color, known pieces are of the earlier patterns of #150 Pointed Oval in Diamond Point, #1280 Winged Scroll, #160 Locket on Chain. Pieces from this era tend to be bright yellow in color. The color was reissued in a limited supply after 1922 and may be found in #465 Recessed Panel, #351 Priscilla, #473 Narrow Flute with Rim, #451 Cross Lined Flute, #1184 Yeoman, and #1020 cream and sugar. The pieces will usually be accessories, such as vases and compotes. Items found in this later Canary tend to be paler and subtler in color. 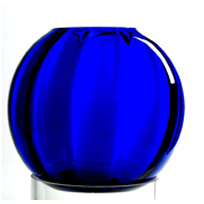 Heisey sometimes referred to Cobalt as “Stiegel Blue.” Cobalt is, as the name implies, a very deep shade of blue.It was used for numerous items, including the #110 dolphin candlestick, the #135 and #141 candlesticks, and the #301 candelabra. Cobalt stem items are found in #3359 Plateau, #3390 Carcassonne, #3397 Gascony, #3404 Spanish, #3408 Jamestown, and #4044 New Era. Cobalt pieces can be found in the pressed-ware patterns of #1401 Empress, #1404 Old Sandwich, #1405 Ipswich, and #1425 Victorian; Blown-ware accessery items include favor vases and ball vases. The 3 ponies and the plug horse are rarely seen in Cobalt. This was a late color, still being produced at the time of Heisey’s closing at the end of 1957. It is like smoke or a dark gray, and is sometimes referred to as charcoal. Limited in production, Dawn shows a shade of amethyst when held to natural light.Dawn is often found in #1632 Lodestar, #1951 Cabochon, #1415 Twentieth Century, and #6009A Roundelay, and other pressed-ware accessory items. Emerald was produced during the first color period, dating from as early as 1897. It is often found with gold rims and is a dark, deep green.It will be found in these patterns: #150 Pointed Oval in Diamond Point, #160 Locket on Chain, #300 Peerless, #1205 Fancy Loop, #1255 Pineapple and Fan, #1280 Winged Scroll, and #1295 Beaded Swag. The richness of the color far surpasses comparable wares being made by other glass companies at the same time. 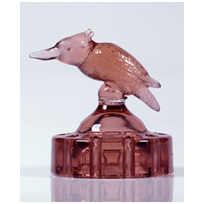 Flamingo can be collected in numerous patterns that were popular during the late 1920s and 1930s. It ranges from light pastel pink to a deep rose.Full table sets can be put together in Flamingo in #1170 Pleat and Panel, #1184 Yeoman, #1252 Twist, and #1401 Empress. Rarely seen are pieces in #1493 Old Sandwich and #1405 Ipswich. A wide variety of stem lines were available in Flamingo as well as other occasional and accessory pieces. 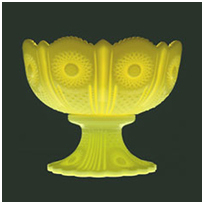 A crystal glass with gold opalescent rims, this color is thought to have been experimental or used for small, special orders. Only a handful of pieces are known in this color. One item known is the #112 Mercury 3″ Candlestick. An experimental color made for trial only, this color contains gold in the cranberry-effected coloring. For the most part, it found its way into the homes of the employees, since it was never produced for consumer use as far as we know. Gold Ruby is listed here not as a color to be collected, but as a point of interest. Under black light, it will fluoresce red.A known item is the #4220 Janice Vase Spiral optic. Hawthorne was first introduced in 1926. This color is found in several shades, from lightest lavender to a brownish, muddy purple. Because of the inconsistency in the color Heisey ceased production in 1927 giving Hawthorne an extremely short period of production.Hawthorne is found in these stem lines: #3324 Delaware, #3359 Plateau, #3360 Penn Charter, #3362 Charter Oak, and #3366 Trojan. Pressed-ware pieces from #1229 Octagon, #1231 Ribbed Octagon, #1184 Yeoman, #411-412 Tudor, #406-407 Coarse Rib, and #417 Double Rib & Panel can be collected. Assorted creams, sugars, nut cups, vases, pitchers, candlesticks, plates, floral bowls, frogs, and other accessory pieces were produced in limited supply in the Hawthorne color. These refer to Heisey’s custard glass. Ivory was the lightest yellow opaque glass. 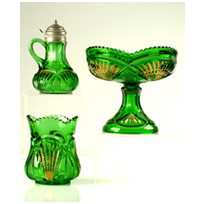 Ivorina Verde was the darker shade of yellow opaque and was more closely associated with what is known today as custard glass. Both colors glow under the black light. Heisey is now known to have been a large producer of custard glass, much of it having earlier been erroneously attributed to Northwood Glass Company.The colors were used in these early patterns: #1280 Winged Scroll, #1225 Plain Band, #1295 Beaded Swag, #1245 Ring Band, #1235 Beaded Panel and Sunburst, #1220 Punty Band, and others, in addition to souvenir items. Limelight and Zircon are the same color; the name changed to Limelight when the color was reissued in the 1950s. Zircon is blue-green, similar to turquoise. However, due to problems in production, there are variations of shades within this color. Some pieces of Limelight tend to be ultramarine, a light to deep greenish blue. Most shades will fluoresce under black light.Zircon can be found in the following patterns: #1485 Saturn, #1504 Provincial, and #1495 Fern. 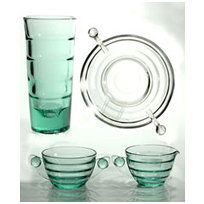 Limelight can be found in #6060 Country Club barware, screen optic. Duncan Miller produced a color similar to Limelight in a pattern like Saturn. When purchasing Limelight in this pattern, do your research if the item is unsigned. This was a brassy amber gold that was made for a short time. The color was susceptible to cracking as it cooled, creating much waste. Marigold was discontinued after a short period. Several pieces of flashed Marigold have been located probably not done at the Heisey factory. An experimental color, called Gold, was similar to Marigold. However, when placed under a black light, Marigold glows, while Gold turns to a salmon red. 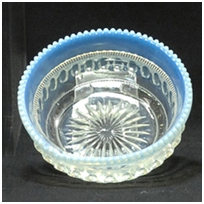 U.S. Glass produced a color similar to Heisey’s Marigold and also produced much Octagon ware, confusing the origins of those pieces. The U.S. Glass plates seen have all been marked with their logo.Marigold will be found most often in the #1252 Twist pattern, but pieces were also poured in Marigold from #1229 Octagon and #1184 Yeoman. 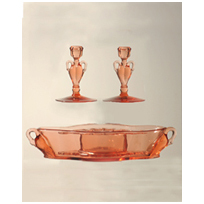 Stemware can be found in #3368 Albemarle and #3380 Old Dominion. Moongleam was probably the first of the pastel colors that Heisey introduced in the mid-1920s. It is basically a lighter form of Emerald, although the early Moongleam pieces are very close to emerald. The #1020 Phyllis cream and sugar can be found in both shades. Heisey called Moongleam “the green of moonlight on the sea” in early ad copy.The most common patterns in Moongleam are #1401 Empress, #1404 Old Sandwich, #1170 Pleat & Panel, #1252 Twist, #500 Octagon and #411 Rib & Panel. Many pieces in Moongleam are very difficult to find. 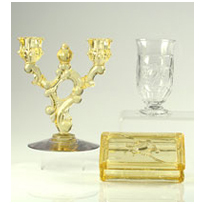 Items in #1425 Victorian, #1425 Warwick & #3397 Gascony would be scarce and quite desirable. 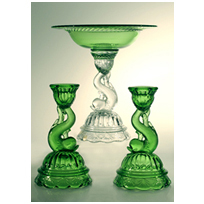 White opaque glass is called “milk glass” today, but Heisey catalogs referred to it as “Opal.” Heisey only made Opal for a short period, from 1898 until the early 1900s. 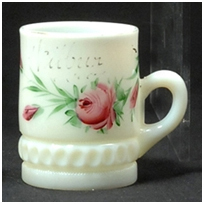 Much of Heisey’s Opal glass was made into souvenir items when other companies purchased and decorated pieces. The Oriental Glass Co. was one such company.Most items in Opal are from the #1295 Beaded Swag pattern. A few items in #1280 Winged Scroll and #160 Locket on Chain were made. Scarce items are the #1255 Pineapple & Fan 1/2 Pt.Tankard, #1220 Punty Band Toy Creamer & Mug and #310 Ring Band Tumbler. Few items in Opal will be marked. Rose is the newest of Heisey colors to be discovered. It is a pastel pink possibly identical to Flamingo. What distinguishes Rose is when it was made. There had long been some mystery attached to certain pieces in very early patterns that showed up in what was assumed to be Flamingo. Newly discovered company inventory lists for 1901 – 1903 show these items in a color called Rose. Pieces found in Rose are predominately in the #325 Pillows pattern. The #1 candlestick can also be found in Rose. A sparkling pastel yellow color introduced by Heisey to replace the failed Marigold color, Sahara was well received by the public.Sahara was made in a many different patterns with #1401 Empress having the widest assortment of pieces as well as #1404 Old Sandwich, #1405 Ipswich, and #1186 Yeoman. 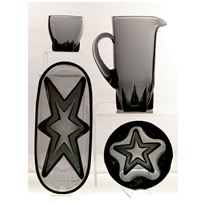 Several stemware lines offered items in Sahara: #3390 Carcassonne, #3381 Creole, and #3380 Old Dominion. Many patterns offered only a few items. Highly sought after patterns in Sahara are, #1447 Rococo, #1425 Victorian and #3404 Spanish, to name just a few. Many rare items can be had in Sahara, but you will search long and hard to find them. Tangerine will vary in color from a light orange to almost a true red. 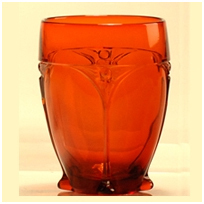 The color was difficult to control because the piece had to be reheated in the glory hole after it was finished to bring out the true coloring.Most pieces of Tangerine will be found in the stemware lines: #3397 Gascony, #3389 Duquesne, #3404 Spanish. The #1401 Empress pattern had two sizes of plates, a sugar & cream, and several bowls. A table setting cannot be put together in Tangerine. 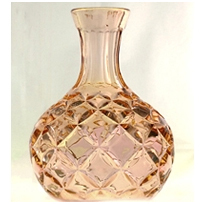 Favor vases are very desirable items. Any item in Tangerine will bring a high price. See discussion under Limelight and Zircon above.